PCS members in the National Gallery have announced a further four stoppages in a continuation of their dispute with the employer. Gallery assistants will stop work for 2 hours in protest against cuts to their number, which have resulted in assistants being asked to cover more than one room – putting both the art and the visitors at risk. PCS members across the union can show their support by sending messages of support to graham.eve@ng-london.org.uk. The first stoppage takes place on Friday 27 July from 13.00 – 15.00. PCS representatives and members are very welcome to join strikers outside the gallery in Trafalgar Square. We want to make sure not only that members can see how well supported they are but also that the public are made fully aware of how important gallery assistants are to the running of the gallery and why they should back our campaign for more permanent staff. Let’s make sure the Olympics is not the only show in town that day! 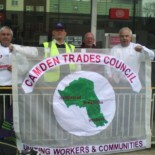 This entry was posted on July 25, 2012 by CAMDEN TRADES COUNCIL.